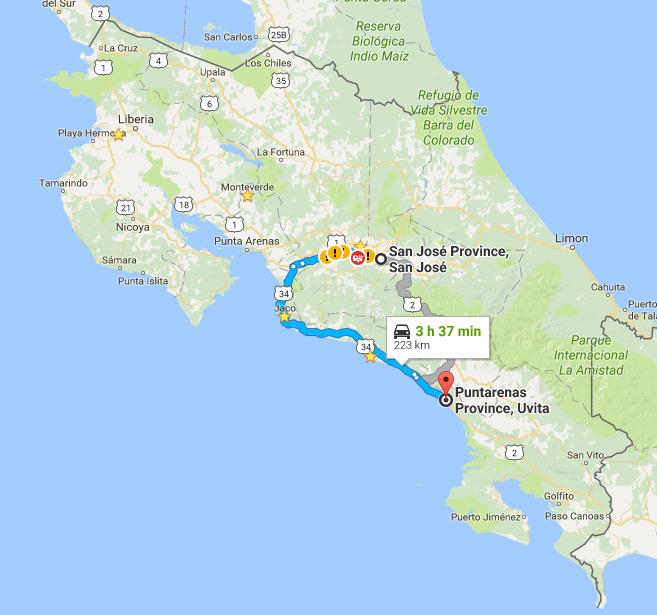 If you are renting a car in Costa Rica you should definitely read my tips on renting and tips on driving to learn all about safety, renting process and other helpful tips. This article will cover specific road conditions on some of the most commonly used roads. It will also cover the most common routes you will take if you are visiting the main cities in Costa Rica. In general, roads vary in Costa Rica from two-lane highways to nice quiet paved roads through towns and well maintained and graded dirt roads all the way to pothole dirt roads that will leave you fearing for your life. When it comes to renting a car I definitely suggest paying the extra for a 4x4 with 4 wheel drive. I’ll be honest, I didn’t and I kicked myself multiple times. My Experience: I arrived in San Jose at 1pm and by the time I went through customs and got my rental car I left around 2:30pm. The route from San Jose to Uvita (or the Dominical area) is quite easy and straightforward. I drove straight through and arrived in Ojochal around 6pm. Entirely paved but varies between 2-4 lane highway. Make sure you have money for the tolls, and be aware they only take colones or small american bills. There were about 3 tolls ranging in price and I spent about $5 total. Completely paved over with good signage. Mostly a two lane road. Many people will pass you. Be careful for animals many cross route 34 and get hit. Route 606 in Costa Rica is 36 km total. The first 20 km is completely paved and gains elevation quickly. The views are fantastic, but remember to pay close attention to the road. The last 20 km is dirt road and usually well maintained. If you are driving during dry season I wouldn’t be too worried driving this with a standard car. If it is wet season a 4x4 with 4 wheel drive would be necessary. Don’t drive this road at night – there are no guard rails and no lights! Route 142 which wraps around the entire lake is paved throughout. The road is hilly and a one lane road. Often times you will get stuck behind large slow moving trucks. It is frustrating but wait for a good spot to pass – I saw way too many accidents on this road. Note that there are only 2 gas stations along this road; one in Nuevo Arenal and one in Tilaran. Don’t let your gas get too low.